For many years the world knew only this second violin concerto by Bartók, but when he came to write it in the late 1930s he already had one youthful effort behind him, written for his early love, Stefi Geyer. She never played the first concerto and it did not become known until after her death in 1956, but it gave Bartók a good idea of how a solo violin fitted with an orchestra. Then in 1928 the composer wrote his two Rhapsodies for violin and piano, which he arranged for orchestra the following year. One of his many violinist friends, the great virtuoso Zoltán Székely who premiered both versions of the Second Rhapsody, had long hoped for a concerto and in 1936 again proposed one. Bartók started studying the concertos by Weill, Szymanowski and Berg but really wanted to write a large work in variation form, while Székely wished for a normal concerto. 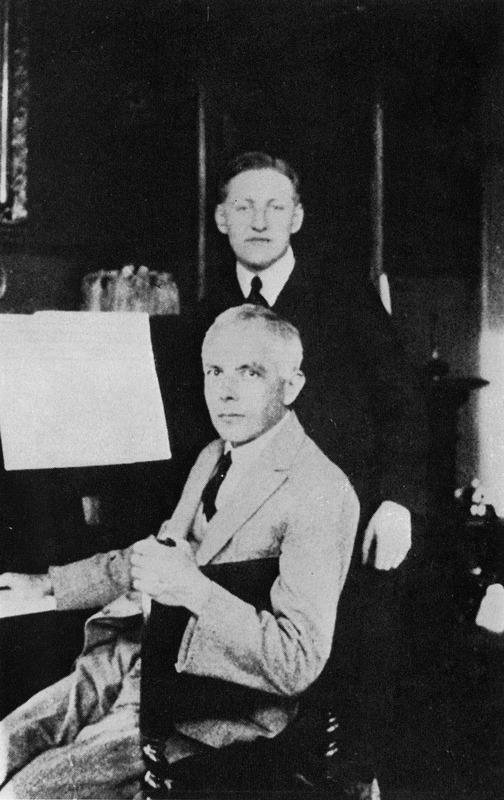 In the end both got what they wanted, as the concerto Bartók composed in 1937–38 is actually a set of variations, framed by two movements that are variants of each other. In 1937 Székely, who was then based in The Netherlands, took over leadership of the New Hungarian Quartet. 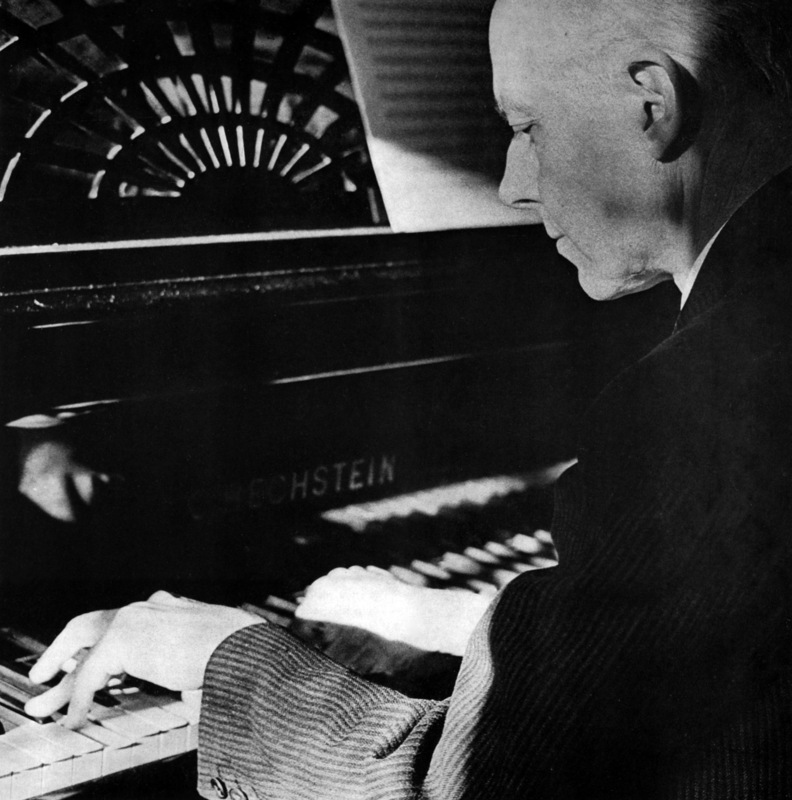 Bartók was worried that this time-consuming job would prevent him from giving the proposed concerto its full quota of performances, but Székely promised to set time aside each year for solo work; he was therefore available to premiere the Second Concerto in Amsterdam on March 23, 1939, with the Concertgebouw Orkest under Willem Mengelberg. The radio recording of the premiere is in excellent sound and both soloist and orchestra play superbly. Székely was given three years’ exclusive rights to the work, but after the onset of World War II and the invasion of The Netherlands by Germany, he was trapped there for the duration of hostilities, along with his quartet colleagues, suffering considerable privations. Bartók, who had emigrated to New York, wrote to Székely (in German, to pacify the Nazi censors) on 10 December 1940 informing him that he was reducing his friend’s sole rights to 13 months and the work would be available to other performers from September 1, 1941.
later that year with the Philharmonic-Symphony, on both occasions with Artur Rodzinski conducting. Bartók was at the Carnegie Hall performance. Britons first heard the concerto in a broadcast from Bedford on September 20, 1944, with Yehudi Menuhin as soloist and Sir Adrian Boult conducting the BBC Symphony Orchestra. The Netherlands not only provided Zoltán Székely with his wife, his long-term base and one of his most loyal audiences, but also his violin, the ‘Michelangelo’ Strad of 1718. On May 4, 1924, Székely appeared at the Royal Albert Hall in London as supporting artist in a recital by the great Irish tenor John McCormack; on his 1920 János Tóth instrument he played the Variations on a Hungarian Theme by his teacher Hubay, d’Ambrosio’s Serenade and Scharwenka’s D minor Polonaise. Among those who came backstage to congratulate him was Jaap de Graaff, a Dutch businessman. ‘You played so beautifully that I feel you deserve one of the fine violins,’ de Graaff said. 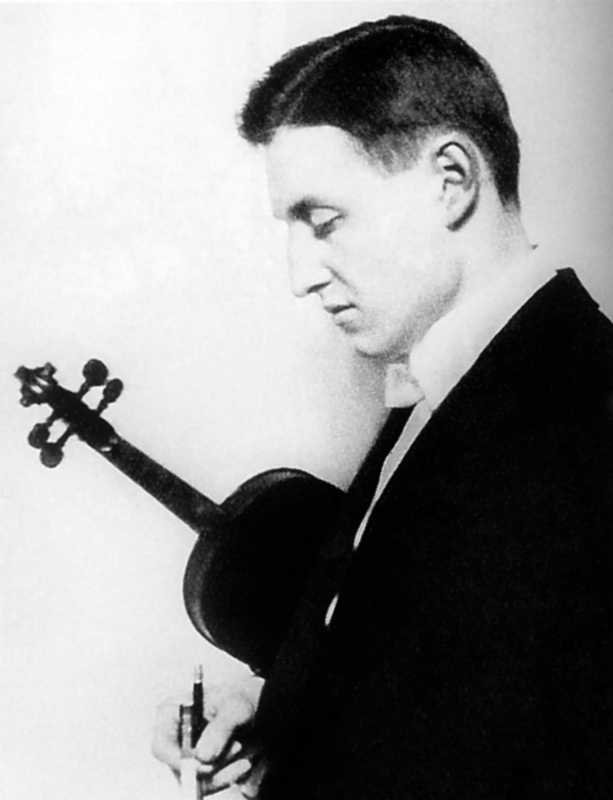 ‘You must search around, and when you find the violin that you really like – I don’t care what it is – then I will make it possible for you to play on that violin.’ Three years later, in 1927, he acquired the ‘Michelangelo’ from the Paris dealers Maucotel et Deschamp on Székely’s behalf, after the violinist had tried it out on the stage of the Salle Gaveau. Székely can be heard playing the ‘Michelangelo’ in the off-air recording of the Bartók Concerto premiere as well as a few solo records, notably the Glazunov Concerto, and a host of quartet recordings including two Beethoven cycles and perhaps the best-ever Bartók cycle. Before Székely owned it, the violin may have been owned by a Comte de Gabriac in France and possibly by a Russian aristocrat. 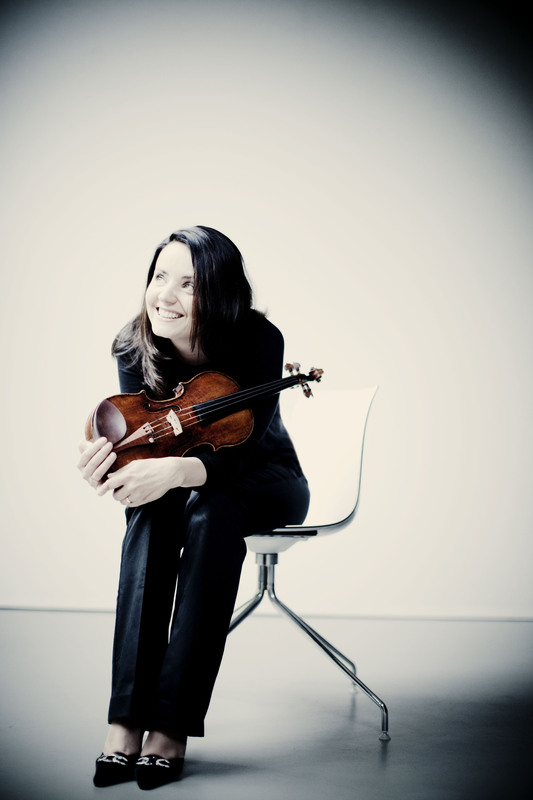 Baiba Skride plays the ‘Baron Feilitzsch, Heermann’ Stradivari of 1734 belonging to Gidon Kremer. Baron Feilitzsch was an amateur player, and Hugo Heermann was a German violinist who studied with Joseph Joachim and owned the violin until 1901. Kremer bought the violin in 1979 and it has been on loan to Skride, his compatriot, since 2010. The original label says 1734, but there has been some speculation that it has been altered from 1731, and the scroll is most likely by Sacconi. “This is a late Strad from 1734. It’s a very special instrument, with amazing colour and a non-typical sound. It took time to become familiar with it like all Strads, and with this one you cannot push it, you have to adapt to the sound it makes. I was looking around for an instrument four years ago and Gidon Kremer so generously approached me and asked if I wanted to try his. Fifteen years ago I asked the late Robert Bein to help me understand the different periods of Guarneri ‘del Gesù’s work. He asked me what I had noticed so far and I said I thought there was so much variation of style and model that ‘del Gesù’ must have been a very unpredictable and capricious maker. I remember he raised his thick eyebrows and said, ‘No way, man. 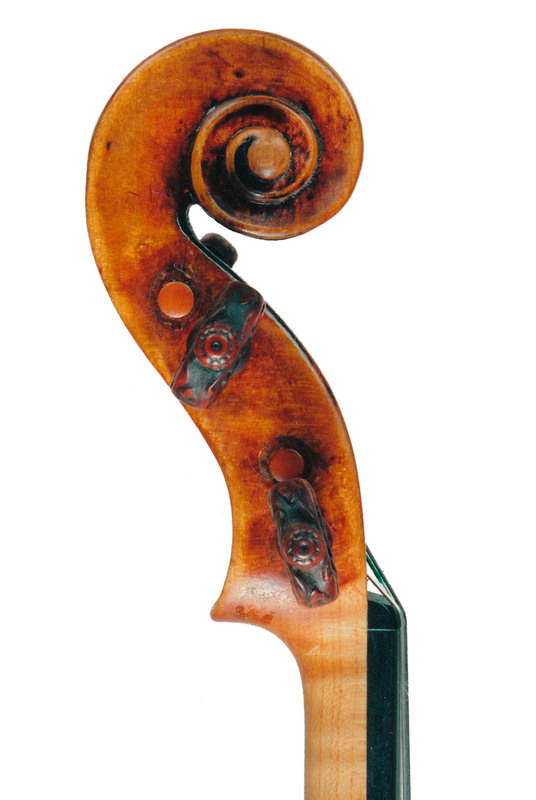 Guarneri was a creative genius but he’s one of the most predictable makers you’ll ever know.’ And in fact I had completely misunderstood; for all his reputation as a mad genius, ‘del Gesù’ is actually a regular and programatic maker – to understand him one must simply see the periods of his work in smaller spans. Over his relatively short working life (c. 1725–44) ‘del Gesù’ created an extremely diverse body of work, but his instruments are easily classifiable into periods, each lasting no more than two or three years before he moved on to a new idea. In fact we now understand that ‘del Gesù’ often made instruments in matched sets; we find pairs and trios of violins from the same year made of exactly the same wood on the same model according to the same ideas and with the same details. From a violin making perspective there is a certain simplicity and efficiency in this; making two violins at the same time is faster than making two in succession, especially for a maker working alone. The implications of this on expertise are significant. For many years the ‘Gibson, Huberman’ Guarneri ‘del Gesù’ was dated to 1734, but there was always something about this date that did not ring true. The style of making, outline, set of the sound-holes and wood choice just does not fit with the other violins from 1734. In fact, only by finding a near ‘twin’ in the 1731 ‘Geneva, Turettini’, which is currently in the collection of the Juilliard School, are we able to arrive at a more credible date for the ‘Gibson, Huberman’. 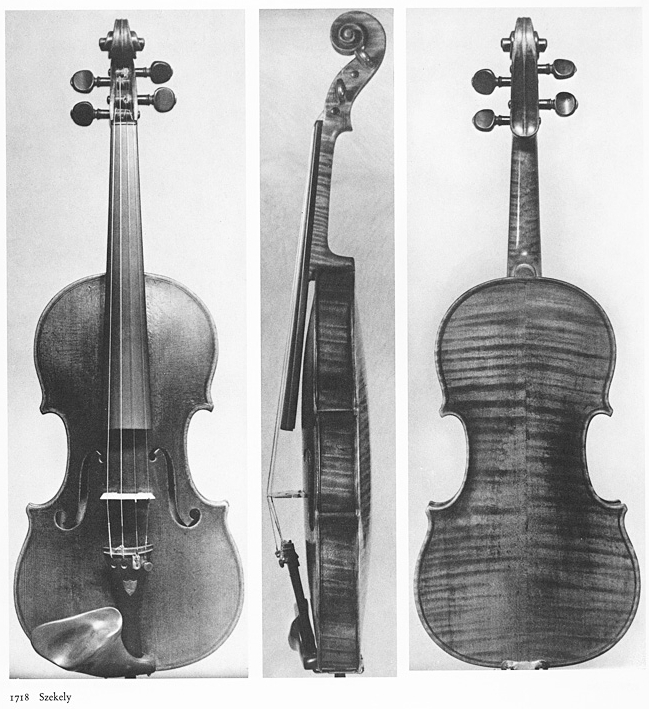 Photographs of the two instruments reproduced here show that the wood used for their backs is a mirrored match; the flames of the ‘Gibson, Huberman’ descend from right to left and those of the ‘Geneva, Turettini’ descend from left to right. If one were to reverse the orientation of the backs we would see that the wood was from the same tree and nearly identical. From this pairing we are able to assign a much more logical date of c. 1731 to the ‘Gibson, Huberman’. The careful study of Guarneri violins in the late 20th century, much of which was initiated by Robert Bein, has enabled modern expertise to make patterns out of what might otherwise seem – to the unstudied eye – to be an unpredictable and capricious sort of mad genius.